Today I have another Christmas Card to share with you to inspire you to get started on your holiday cards! 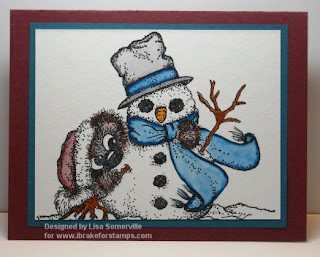 For today's card, I stamped my Snowman Shy Bear from I Brake for Stamps in Black Ink, and used the Marker Water Coloring Technique to color my images. Be sure to stop by Pat's Blog later today to see what she created and to visit the links of the other TJNL girls who played today.